Cast: Pets Tseng, Lou Hong Zheng, Huang Wei Jin, Sylvia Wang, Zhao Zhi Wei and Chen De Xiu. After receiving news about K.O One class being in danger, Lei Ting (Pets Tseng) and Xiu (Chen De Xiu) return to the gold dimension, only to be separated. 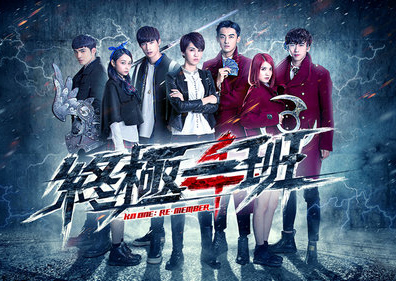 Xiu manages to return to the class and meets up with Gu Zhan (Lou Hong Zheng), Zhi Ge (Huang Wei Jin) and Qiu Qiu (Sylvia Wang), but unfortunately Ling Tei seems to have disappeared. They soon track her down to a house, where they meet a trio from another school led by Zhi (Zhao Zhi Wei), though the trio admits to finding her, but haven't done anything to her. Tension arise, Lei Ting appears, but she seems to have lost her memories. Out of all K.O. One seasons, this one has the best quality when it comes to the fighting scenes/use of magic. Also, this is the first season without Wang Da Dong (Jiro Wang), which means the storyline follows the "newer" characters that weren't in the very first season. This also means the K.O. series has changed both leads and shifted the narrative. This isn't necessary bad, as it kind of needed some freshness to it, and these actors actually manage to keep it interesting. Unfortunately, the only thing that I really liked in this drama was the couple of Gu Zhan and Qiu Qiu: everything else was way too 'melodrama' and there was a huge lack of fighting. I know that K.O. One isn't only about the fighting, but considering the title "K.O. One", the drama should be about the K.O. ranking, which was only mentioned very few times. And they really saved a lot of fighting for some reason. Even though the acting and the dialogues were good, there were too many fillers to be honest. I was actually yearning for more lead couple moments because of it – which by the is one the reasons for my rating. Another one is because, even if this is on the frivolous side, the overall acting is quite great.